Hagel Defends Trade of Guantanamo Prisoners For U.S. Soldier : The Two-Way Secretary of Defense Chuck Hagel said officials believed Bowe Bergdahl's life was in danger, so the administration had to act quickly. Bergdahl was released after almost five years in captivity. 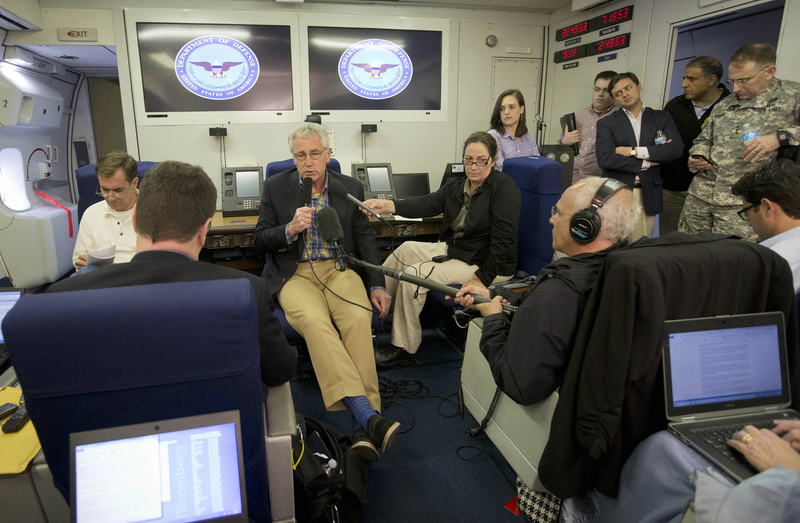 Defense Secretary Chuck Hagel, center, speaks to members of the media aboard a U.S. military aircraft on Sunday. Hagel said quick action was necessary to save Sgt. Bowe Bergdahl's life, leaving no time to disclose the administration's plans to Congress. A day after Taliban officials handed him over to a group of American Special Forces, Sgt. Bowe Bergdahl is now receiving a medical evaluation at Landstuhl Regional Medical Center in Germany. That's according to Secretary of Defense Chuck Hagel, who spoke to reporters during a pre-scheduled trip to Bagram Air Field in Afghanistan. Hagel also defended the swift nature of the deal the U.S. struck with Bergdahl's Taliban captors. As we reported, the U.S. agreed to release five Guantánamo Taliban prisoners in exchange for Bergdahl, who had been held captive for almost five years. The operation was not disclosed to Congress, Hagel told reporters, because U.S. officials believed Bergdahl's life was in danger and they had to act quickly to get him out of Afghanistan. "It was our judgment that if we could find an opening, and move very quickly with that opening, that we needed to get him out of there, essentially to save his life," Hagel said, according to the AP. Meanwhile, two Republican lawmakers are claiming that President Obama broke a law that requires the president to give Congress 30 days notice before transferring any Guantánamo detainees. In a joint statement, California Rep. Howard McKeon, the chairman of the House Armed Services Committee, and Oklahoma Sen. James Inhofe also criticized the prisoner swap because they say it now creates an incentive for "our terrorist adversaries ... to capture Americans." "Our joy at Sergeant Bergdahl's release is tempered by the fact that President Obama chose to ignore the law, not to mention sound policy, to achieve it," the lawmakers said. Hagel told reporters he believed Article II of the Constitution gave Obama, as commander-in-chief, power to authorize a prisoner swap without consulting Congress. There will, no doubt, be many more developments in this story throughout the day. We'll keep this post updated with the latest. In an emotional address from Gowen Field National Guard Installation in Boise, Idaho, Bergdahl's father and mother addressed their son directly. Bob Bergdahl said they have not had a chance to talk to Bowe. He said there's a reason for that. It is what military psychologists have recommended. "Bowe has been gone so long that it's going to be very difficult to come back," Bob said. "It's like a diver going deep on a dive and has to stage back up through decompression to get the nitrogen bubbles out of his system. If he comes up too fast, it could kill him." Jani Bergdahl said she was looking forward to seeing Bowe's face, to giving him a big bear hug. "I will see you soon my beloved son. I love you Bowe." Bob said: "Bowe I love you. I am your father." He added that he was proud of Bowe and "your desire and your action to serve this country in a very difficult war." "Most of all," Bob said, "I am proud of how much you wanted to help the Afghan people." Bob went on to thank the American people and the American government, saying when something like this happens you see "parts of your government that you never knew were there." "Bowe you were not left behind," Bob said. "I told you wouldn't be left behind. But that wasn't easy. You'll never know how complicated this was in such a complicated area." In a press release, the Landstuhl Regional Medical Center said Bergdahl had arrived at 9 a.m. June 1 and had begun his "reintegration process." "Trained and highly capable military health care providers will evaluate his condition, begin any necessary medical care and assist in his recovery process," the center said. "There is no pre-determined amount of time involved in the reintegration process. The Landstuhl staff is sensitive to what Sgt. Bergdahl has been through and will proceed with his reintegration at a pace with which he is comfortable. The full focus of the Landstuhl team is to provide necessary medical care and a safe environment for his recovery." Talking to CNN, National Security Adviser Susan Rice said this operation wasn't "unknown to Congress." She said Congress had been told that something like this was on the table, but Congress was not told in advance about this specific deal. Rice said the Obama administration decided it was "necessary and appropriate" to skip congressional notification. Had the administration informed Congress, Rice said, it may have meant that the opportunity to recover Bergdahl may have been missed. "What we put the highest premium on was the safety of Sgt. Bergdahl," Rice said. "This was held closely within the administration. We could not take any risk with losing the opportunity to bring him back safely." CNN's Candy Crowley asked Rice if this means the U.S. now negotiates with terrorists. Rice said she wouldn't put it like that. "When we are in battle with terrorists and terrorists take an American prisoner, that prisoner is still a U.S. service man or woman," Rice said. "We still have a sacred obligation to bring that person back. We did so and that's ... to be celebrated." In case you missed it, President Obama appeared in the Rose Garden of the White House Saturday afternoon with Bergdahl's parents. "He wasn't forgotten by his community in Idaho, or the military, which rallied to support the Bergdahls through thick and thin," Obama said. "And he wasn't forgotten by his country, because the United States of America does not ever leave our men and women in uniform behind." At the end of the brief appearance, Robert Bergdahl delivered a message to his son, in Arabic. His son's English, Bergdahl explained, had suffered in captivity. "Bismillah al-Rahman al-Rahim," Robert Bergdahl began. That's a common Arabic phrase meaning, "In the name of God, most Gracious, most Compassionate." After a few more words in Pashto, Robert Bergdahl closed by saying, "I'm your father, Bowe."